Whether you’re planning a marquee wedding or garden reception, the styling of your wedding will have a huge influence on the overall look and feel of your day. Decor, flowers, furniture and even stationery can all be used to bring your “dream wedding” to life from beginning to end. Now, let’s be honest – you’ve probably already spent countless hours searching Pinterest and swiping through the Instagram feeds of your favourite vendors. But when it comes to narrowing down your wedding colours and decorations to suit your desired wedding theme – where should you actually begin? We know that getting clear on your wedding colours and decorations can be overwhelming with so much beautiful inspiration out there. So, we thought we’d reach out to our resident styling professionals, the talented team at Ivy & Bleu Events, for their expert tips and tricks! From choosing the perfect colour scheme to selecting the right table decorations to make an impact, keep reading for some styling advice from Mandi at Ivy & Bleu, along with some beautiful table decorating inspiration from Coolibah Downs to get you started. Where do you look for inspiration when choosing wedding colours and decorations? At Ivy & Bleu, we love to combine simplistic styling with textural elegance throughout all of our work. Our styling is something that we base off personal taste and interests, items and features throughout our homes, and even pieces within our wardrobe – yes, even something like my shoe collection is a place where I can draw inspiration from! How do you find colours that work well together? When it comes to colour palettes and combinations, we find it’s really important to follow the colour wheel principles. We then work with that by then picking a highlight colour first, and pairing it with one or two neutral colours – thus creating a contrasting and effective colour palette! What kind of colour combinations are currently trending? Colour trends are constantly evolving and changing, especially in the event & styling industry. 2017 was a year which was all about the greys, however this year we have started to see a shift and focus on slightly warmer tones such as latte, coffee tones and the return of champagne – everything makes a come back sooner or later! What are your top tips on selecting table decorations? When styling a table, one of our favourite styling “musts” are flowers, flowers, flowers! They are such an alluring and graceful focal point that will always look beautiful at any event. We then always highlight our blooms with some beautiful table linens and some simple styling & lighting to complete the look! A big thanks to Mandi from Ivy & Bleu for her table decorating tips – we can’t wait to see what the Ivy & Bleu team create next at our beautiful hinterland wedding venue. For more table decorating ideas and inspiration, you can also check out our Pinterest and Instagram pages for a behind-the-scenes look at our favourite images from recent weddings and events. 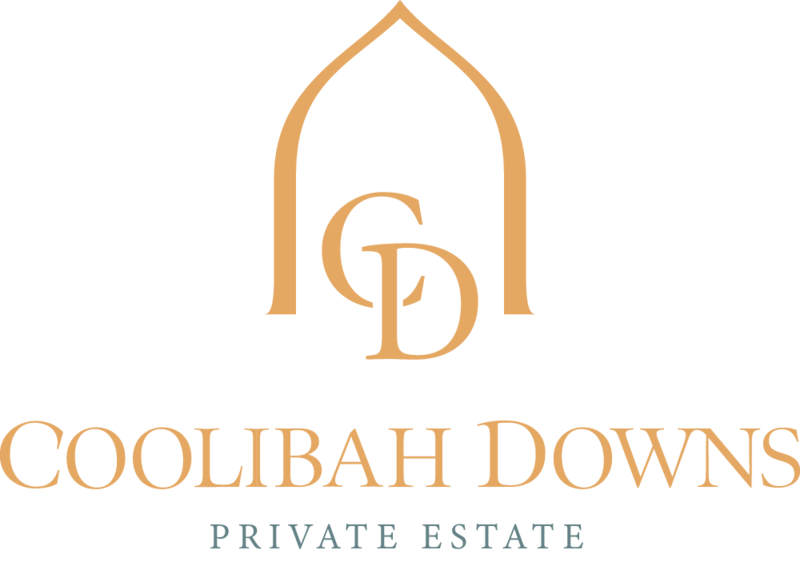 Or, see more of our real weddings and wedding planning tips via the Coolibah Downs blog. 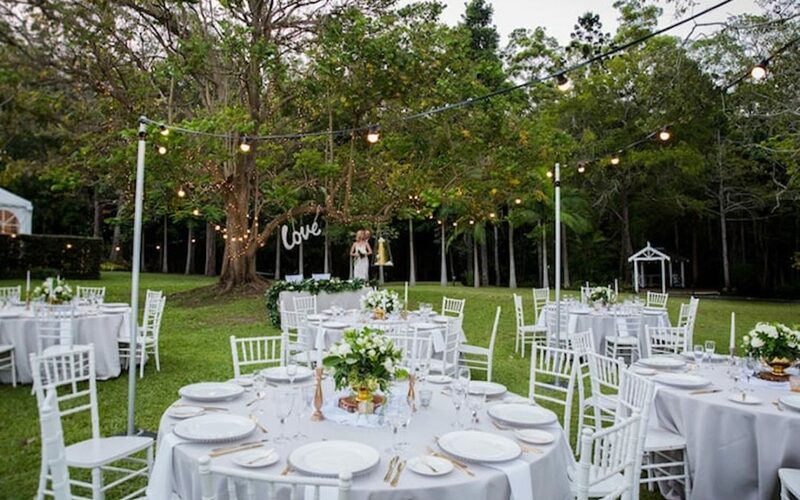 And if you’re currently looking for the perfect Gold Coast wedding venue, we’d love to welcome you for a tour at our hinterland location. From our intimate marquee to our sweet stone chapel and lush gardens, our award-winning venue can host your entire day from ceremony to reception. Get in touch with our weddings team to book a site tour, or download a copy of our latest wedding packages to get started!